Do You Need a Bag Dump Station? Our bag dump stations are robustly designed to take the abuse of constant use. All of the components are constructed of 10ga minimum thickness, with stiffeners to provide added strength. 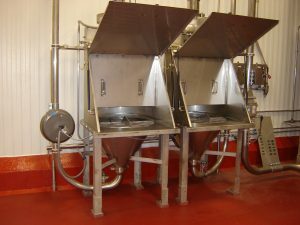 A standard bag dump station includes a product cone with attached legs, housing enclosure, containment door, dust collection hood, grating, and bag break blade. 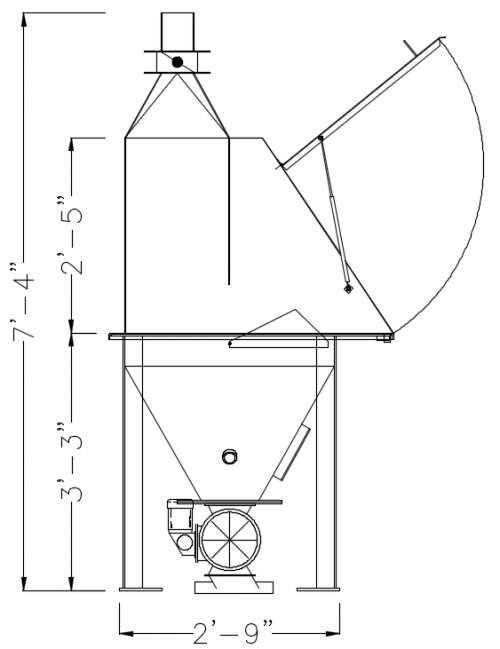 Dust collection can be selected for either a centralized system or a self-contained system. Adaptors for various methods of discharge are available to best meet the customers’ needs. A hopper capacity of seven cubic feet is standard on the bag dump stations. 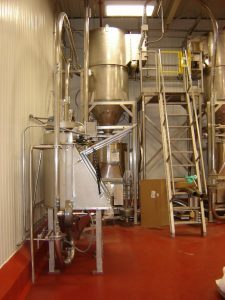 The hopper opening is covered by a grating fabricated from quarter inch steel set with three inch spacing. A bag break is blade located on the grating to aid in bag opening. For easy effort, the door assembly is supported through the use of gas spring cylinders to aid in the opening and closing of the door. The door includes a proximity switch for dust collection control.